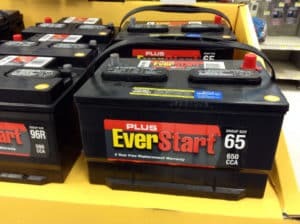 Are you going to purchase a new car battery for your car? Car batteries have a lot of different specifications that you should be aware of. Modern cars use a lot of electronics and it’s really important that you get the right battery for your car. In this article, we will help you to find the information you need of how to find the right car battery for your needs and how you can convert CCA to Ah/Ampere Hours. What is Ampere Hours (Ah)? The Ampere measures the flow of electrons and current within a conductor. A single Ampere represents a single coulomb of electrical charge, which is passing throughout every part of the conducting item within a second. Battery measurements are commonly written out in a portion of the Ampere Hour (Ah), the milliampere hour (mAh), which represents 1/1000. This unit represents the battery operation threshold, which can be used to calculate how long the battery might be able to last without recharging. Battery capacity can be dependent on the dynamic environment within which the battery is used. Since it is heavily dependent on consistent use, factors such as spikes in intensity of use could affect the accuracy of this determination. Amp Hours is also heavily based on relative capacity between two batteries, which reduces its accuracy levels in helping determine the exact time of use. Amp Hours (AH) may be presented on your battery as 200AH @ 25 HR, which means that the battery would provide a constant supply of usable current for 25 hours at a rate of 8 amps. Knowing this unit will help choose the better lasting battery by capacity. Battery capacity reduces with use. Even if your battery reads a specific number of Amp Hours, the rate of discharge will increase over time in a non-linear way. When calculating aH, you should account for this drop in performance to find an accurate capacity for the specific battery. What is Cold Cranking Amps? You can turn Cold Cranking Amps (CCA) into Ah to be better able to find battery capacity. A large number of batteries use CCA to present the battery’s ability to start an engine at certain temperatures, usually ranging between 30-32 degrees Fahrenheit. While knowing this starting power can help you choose the better battery, you will need to convert CCA to Ah to determine capacity. CCA can be a good unit of measure to help you determine the better battery for you if live in cold conditions. Higher capacity and power batteries will have better CCA values than weaker batteries. Even as the battery power deteriorates over time, they will be more likely to last longer and provide better service over time. Even though you will not be able to calculate battery capacity, you will still be able to determine the better battery for replacement. There is no correlation between the CCA and Ah. Therefore you can’t convert it directly to get the exact value. However, you can get a rule of thumb value for the most batteries, even if it’s not an exact value depending on the battery. The rule of thumb for converting CCA to AH is dividing it by a 7.25 constant. For instance, if your battery is marked with a 1450 CCA, it represents 200AH. A battery of this rating should last for 25 hours while producing a voltage of 8 amps. It could last for 20 hours if it produces a voltage of 10 hours. Understanding your rate of use as well as your voltage level will help you make the right battery choices even if you only have the CCA figures. Conversely, if you have the AH ratings on your battery, you can calculate the CCA measurement to know how suitable your battery is for cranking your engine in cold temperatures. 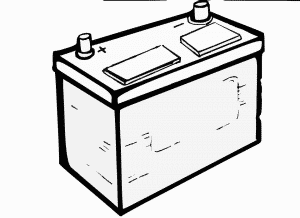 If you are having car troubles, you could be having a bad battery. Before determining that your battery is bad, you need to confirm that all the terminals are tied down securely and that all connections are in good condition. This way, you will not accidentally replace a functional battery, which could be wasteful. You should clean your wiring and battery to prevent a parasitic drain of voltage. You can determine your battery is functional by jumpstarting your vehicle and leaving it running for a short time. Turn it off for a duration, before switching it on for a similar length of time. If your battery fails to start, you will need to replace it. Check our guide: Best car batteries to buy if you want to get more information about great car batteries. You can find the appropriate run time for your battery and prolong its life span by knowing how to calculate its capacity. However, it can be difficult to know your battery’s capacity while knowing only the ampere-hour (Ah), which is provided for most batteries. You need to calculate the Cold Cranking Amps to know the capacity and potential performance to have a better understanding of your battery. Understanding how to convert CCA to Ah will help make the calculations easier. Always take the safety first approach when testing, replacing or using batteries. You should not take any shortcuts in reading or understanding your tutorial as this will make it easier to know how to handle the battery and acid carefully. You should also carry out regular maintenance, especially people who live in hotter environments. You should always store your batteries carefully – and ensure that all batteries are recharged after they discharge. You should not discharge a battery beyond its expected capacity since this will increase the likelihood of wearing out. You should regularly add the electrolyte into your battery – as well as ensure you replace it with the right sized battery to maintain performance levels. Understanding how to convert CCA to AH will help you find the best fit when you are replacing your battery. You should secure your battery when mounted, and keep your case clean – Avoid tilting over your battery when recharging or jumpstarting your vehicle. If the electrolyte reaches hot boiling temperature, it could increase your battery’s risk of damage. You should also avoid charging your batteries if they are frozen.